We first began experimenting with meads (also known as honey wines) at Four Quarters in 2002. Drawing upon our commitment to sustainable living and the support of our membership we sought to create a cottage business to help support the monastery at Four Quarters. We take our mead-making very seriously and are continuously striving to improve our technique and the quality of our mead varieties. Because we create our wines in limited quantities as small batches, each batch receives tender, hand-crafted care. 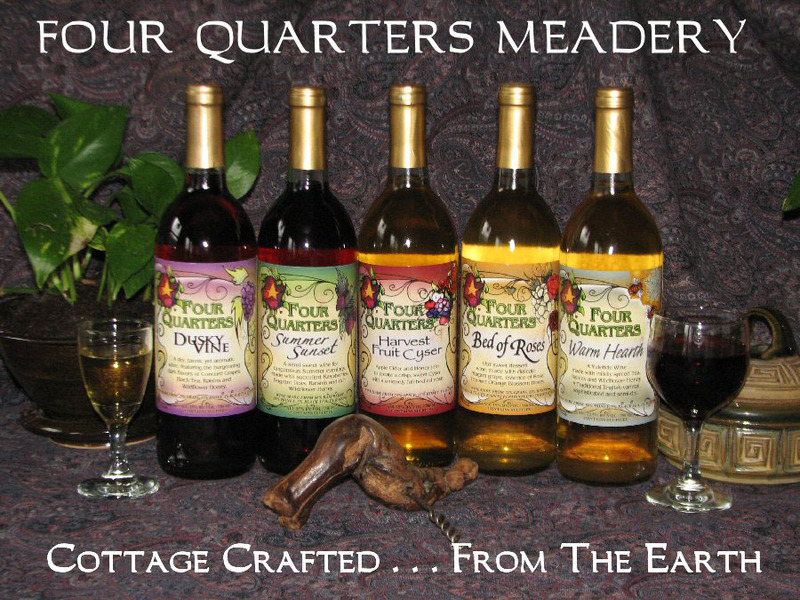 Four Quarters Meadery officially came into being when we received our Pennsylvania Limited Winery license in 2006, and we have not looked back since. Located at 190 Walker Lane in Artemas, PA. The meadery is open daily for tastings; please call ahead. 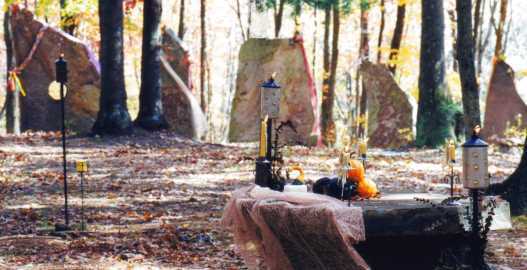 We are an interfaith church and campground with an organic garden that supplies some food for the monastery's table. This commitment to local and sustainable agriculture is a part of our mead-making, too. We search out local suppliers wherever possible and purchase our ingredients without regard to cost. We are open every day of the year and really do enjoy visitors, so feel free to call us and plan a visit. During the summer season you can visit our garden and orchard, sample our meads, swim in the river and take a tour through our retreat camp to visit our widely known Circle of Standing Stones. Because Four Quarters is a non-profit organization, 100% of the profits from your purchases go towards sustaining the 150 acre tract of land that is the heart of Four Quarters, held in perpetual trust, and listed as the most ecologically diverse tract of land in Bedford County, Pennsylvania by the Western Pennsylvania Nature Conservancy. Your support makes a real difference in preserving the land and our Interfaith Sanctuary. We hope you will have the satisfaction of helping to maintain this special and sacred place, while you enjoy our very special meads.